The western world is obsessed with youth, refusing to grow old gracefully, or even grow old. While this obsession has ignited a craze in companies marketing products that supposedly promise access to the fountain of youth, it has also ignited a passionate interest in yoga. Not such a bad thing… yoga can benefit bodies of varied shapes, sizes, conditions and ages. There is an abundance of benefits awaiting you in yoga class. Increased agility, balance, strength, flexibility, endurance, increased lung capacity, stress reduction and of course, the mind-body-soul connection. Of course, there is one other necessary ingredient – discipline. You have to come to class on a regular basis to reap these awesome benefits. My Yoga for an Ageless Body classes were created with the mindset that no matter what your physical age, you can have a mind and body that defy the typical aging paradyme. By using yoga therapy principles and incorporating the aspects of yoga that focus on stress reduction, posture, balance and movement, the students have the ability to reduce or even reverse various so called “aging” issues well up into their fourth generation years. Take a moment to assess where you on on the age spectrum. Forget your physical age and just note where you stand on energy level, joint health, flexibility, focus and other biomarkers of aging. Do you have trouble sleeping? Are you fatigued in the afternoons? Do you find your mind wandering or unable to focus on a task? Do you experience stiff joints and other aches and pains? If you are experiencing one or more of these complaints, rush to the matt and add a regular yoga routine to your day. Then find a convenient yoga class near you and go once or preferable twice a week. The uplifting group energy found in class is hard to experience at home alone. Yoga is a lifestyle (I will cover this more in a future blog) and what begins as a desire to just get more flexibility may turn into a transformation. If the yoga bug bites, these is no end to the benefits and wisdom that can be gained from the many aspects of the practice. 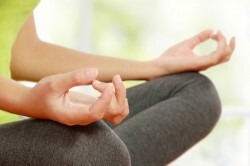 Yoga as a healing modality has gained popularity in the alternative and natural healing fields. Even the medical community is waking up and taking note of the various studies done providing evidence of the benefits of yoga on certain physical and emotional conditions such as carpal tunnel syndrome, heart disease, anxiety, cancer, high blood pressure… the list goes on. Yoga classes can be found on almost every corner in the big cities and even creeping into the smaller, more conservative communities. While most yoga classes can be used as a healing tool, many conditions require the supervision of a trained yoga therapist to provide adequate, safe sequences that will help the body to move towards wellness. For instance, someone with carpal tunnel syndrome could experience a worsening of their condition if they attend a class doing weight-bearing arm poses such as handstand or plank. However, in a therapeutics class led by a yoga therapist, these poses would be avoided or modified to fit the physical needs of the students. If you are experiencing a physical or emotional condition that you would like to use yoga to help with the healing process, take the time to do your research. Not all yoga therapists or therapy classes are based on the same training. Word of mouth and reviews is a great way to find a good yoga therapist, or try out one of their classes to see how your body feels afterwards. Ask questions to see how knowledgeable he/she is regarding your particular condition. And finally, use your intuition! Is donation based yoga the “new wave of yoga”? Have you heard of donation based yoga studios? I became aware this past year of this relatively new concept and my first reaction was “No way! That studio will never make it.” I hope I am wrong because I now am teaching two classes in the new Austin Donation Yoga studio on 6th street. So I did a little research and found out that the donation based concept is thriving in LA and NYC and even here in Austin. However, many donation studios in smaller, less upscale areas are struggling or even closing because they cannot meet expenses. The concept comes from a desire to bring yoga to everyone, no matter what their financial or physical limitations. Goodwill is created with the community and many students that could not otherwise come to yoga class can now get the benefits of a yoga practice. How fitting this is with the new age way of being. And this concept fits in nicely with Triumph Yoga’s basis of yoga for all abilities. I am rooting for this new studio that is open to all and hoping that the idea of giving what you can to support others is here to stay. Why an all male yoga class? I have recently added a Men’s Basic Yoga for Flexibility 6 week series to the class schedule. Let me give an explanation for this decision. Men and women are different. I do not think anyone will argue with me on that one! In yoga, this difference shows up more at the basic level of the practice rather than across the board. Yoga in the west has been stereotyped for years as a gentle exercise more suitable to a woman’s body. The ratio of women to men in a yoga class has traditionally been 10 : 1 but now seems to be moving towards 8:1. Still not a good representation of the male population. Why is it that men seem to stay away from this wonderful way to balance and bring flexibility to the body? Perhaps this goes back to the belief that men are supposed to be strong, competitive and identify with the mentality of sports. Or maybe it stems more from the natural tendency of men to be more tight and less flexible in their muscles and joints. Although girls and boys start out equally limber, by adolescence the boys seem to lose this flexibility faster than the girls. No one really knows why this happens, but it could be related somewhat to differences in hormones, musculature and even the tendency to gravitate towards certain types of activities that over-develop certain muscle groups. Muscular imbalance can cause the tightness and pain many men experience. So, why an all male yoga class? Considering the fantastic benefits everyone gets from doing yoga, I have decided to offer a class that will entice more men to try this form of movement. Let’s take away the pressure of being in a class with lots of flexible women and then provide a practice of warmups and poses geared specifically towards bigger bodies that need more flexibility in muscles and joints along with the development of smaller muscle groups often neglected through other sports and exercise. Besides, an all guy class could be more relaxed with a focus on making yoga fun! Daily, we come across articles or news stories about new studies touting the benefits of a yoga practice for even the most obscure diseases, injuries, disabilities, traumas and emotional states. ADD, Parkinson’s, MS, cancer, back or neck pain, anxiety, hormonal imbalances, arthritis…the list is endless and the benefits are immense. More than just a form of exercise, yoga is a lifestyle and it is the transformation that takes place on the mat that can be taken off the mat into daily life. Body awareness, connecting movement to the breath, finding a place of stillness and peace within all contribute to healthy benefits of a yoga practice. The beautiful part of yoga is that anyone, no matter what your body shape, condition or age, can find benefits through learning some form of the breathing techniques, poses, sounds and hand positions used in this ancient practice. Start where you are, whatever your limitations. Stick with the practice and carefully observe the changes in your body and life. They may not be real obvious at first, but just know that on a subtle level, transformation is happening.